We've all heard of the new battledome that's come out, and for good reason. The age old classic site feature dating back a decade of service has been retired, and in has come a shiny new set of arenas in which the brave and strong are easily separated from the weak and light-hearted. Of course, there are some things that will remain in the old battledome forever; but many new and exciting adventures wait in the new 'dome. So you may be asking yourself: "Where do I start?" Good question! Fear not, for you're one of many readying their gear for the first time to venture out into the wide world of battling. Luckily, there's not too much to learn, and the newer format makes getting started easy. So let's get you going! Now, I'll say this in the name of a good friend of mine who's been playing Neopets for longer than I can remember: "Your pet is your strongest weapon." For it is! No fancy sword or neat tricks will outdo the shear might of a well-trained battle pet. Training is a long process, however, and doesn't come in an instant. It requires a dedication to always have a course going at either the Mystery Island Training School or the Swashbuckling Academy. The first is good for speedy class times, but if you're on a budget, Cap'n Threelegs' services are for you. And it doesn't come cheap! While it may be just a few thousand neopoints for one course, these can add up over time to millions and millions. Due to the costs of training, most people see signing their pet up for courses as a burden sapping at their bank accounts, but in reality, they're missing the larger point of it all. 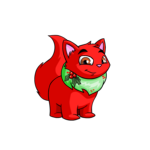 Training your pet is an investment, in that those stats will always be there, and your neopet will be proud to be as strong as it is. Don't think twice about committing to your pets training, as it's always worth it in the long run. Now, before you go enter your first battle, you had best get your pet equipped for the trials and tribulations to come. Make sure that you've got a clear idea of how much you want to spend on them, since there are many components to making your pet successful besides just a bunch of icons. Start with looking at your challenger, and researching what icons their weapons do. Then, depending on your budget, buy whatever shield best takes care of them. You may be using an inexpensive Leaf Shield from Illusen, or a pricy Faerie Tabard from the hidden tower, but either way, shielding your pet from the opponent is priceless in battle on any scale. Next, look out for a healer. One major change from the old battledome to the new battledome is that your pet no longer heals after every fight, meaning you've got to spend money on either using potions after the fact, or healing in the battle itself. Especially for tougher opponents, the second option is a lot more convenient; for healing in the battle means a one-time purchase of equipment that you use every fight rather than having to spend hundreds of neopoints on potions every time. To start, look for the lower level scorchstones, like the blue (30 HP), red (20 HP), or bronze (15 HP) ones; and if you can afford to get a greater healing scroll (50 HP), go for it! These lower level healers are recommended over full healers because the only multi-use ones available either cost dozens of millions, or thousands for a one use supplement. After you're set on a healer and shield, it's time to decide on your primary constant. A constant is another name for a multiple use, hard hitting weapon that does a good amount of icons. Constants come in all levels of damage, with the infamous Super Attack Pea topping out at 32 icons per turn and cheaper lower level swords doing only one or two. If you're on a budget, go for cheaper weapons that do about 7-9 icons of damage. Rainbow Scrolls, Golden Compasses, and even the Molten Branch Sword given out by the advent calendar are great for pinching pennies. For someone with deep pockets, look out for hidden tower "anagram" swords that do 18-24 icons at about ten million apiece. With all these important items, you should be ready to take on the fierce foes of the battledome with ease. Remember, always be on the lookout for your next upgrade; building a battle set is something to be proud of, and your pet will love it! Gear equipped, skills honed, and chomping at the bit, it's time to get a taste of what it's like in the battledome. 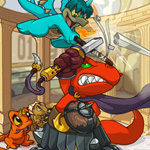 As you travel about Neopia, you may have received some unexpected challenges from well-known villains and warriors. Each and every one of these challengers belong in their respective arenas, or the land they're from. Coming in three different difficulties, all of them starting with easy, progressing onto medium, and then lastly, a super strong ultimatum. Don't worry about the higher difficulties for each one as you begin, and take care to fight only the ones you've got a shot at. Huge opponents like the Snowager have been known to dole out over thirty thousand worth of HP in a single blow! Spicing up your experience with multiple challengers makes things fun, and can also pay out as well. One of the biggest things about the new version of the battledome has to be the prize system. Dreamed about for several years, it's finally a reality; and every day you're entitled to thousands of neopoints and fifteen individual spoils of war. Training goods like codestones are given out universally for every opponent, whereas other prizes are specific to the arena in which you're battling that represents a part of Neopia. Furthermore, specific challengers, like the Shadow Usul and the Tax Beast for example, have prizes unique to them that you can only get from triumphing against them and them only. With the new looks and outstanding attributes the new battledome has, more and more players are realizing that it's not just all about running around and beating people up, but rather that battling can be fun and tangibly worth it. Whether you love the prizes, being able to show off your list of wins, or training your pet to the highest you can go, there's always something fun to do; and it's only going to get better as we see the battledome come out of beta. I hope this guide helped you on your road to becoming a fantastic time in the battledome, and good luck and have fun battling! Maria frowned. "I really want to do something special for you this year, though... Are you really sure?" Some wonderful winter themed treats and drinks that are made especially for this frosty season!